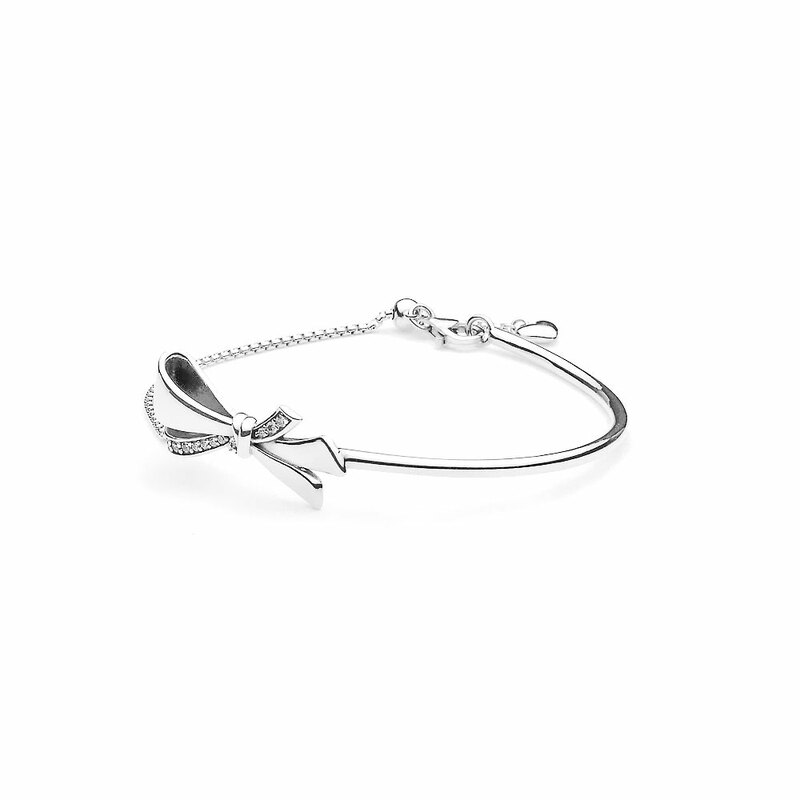 Inspired by vintage designs, this hand-finished sterling silver bracelet acts as a reminder of femininity and strength. Featuring a delicately sculpted bow that is interwoven with sleek silver and strands of sparkling stones, this gorgeous motif symbolises the unbreakable bonds of family. The bracelet has been designed with a sliding clasp, which makes it easy to adjust the bracelet to your desired fit. Available online or in-store. Brilliant Bow Bracelet is rated 4.9 out of 5 by 9. Rated 5 out of 5 by Rinky from Beautiful Design I got this bracelet today and cant wait to wear it over the weekend. Love the way it was designed, half bangle and half chain with a small adjustable knob on chain, so that it perfectly stays on your wrist. This product is worth for the money !! Rated 5 out of 5 by HH2018 from Beautiful bracelet Don't worry too much about the size because It's adjustable. Rated 5 out of 5 by Mel2018 from CLASSY! Got this for Mother's Day and I cannot stop looking at it! It is stunning and just so classy! MUST BUY! Rated 5 out of 5 by USPA from Mother's Day Lovely bracelet. I am glad I bought it for myself to match the ring. Rated 4 out of 5 by Satya from Mother's Day Perfect for elegant dinners, or just a casual day out with the family! Has an adjustable chain, lock is efficient, diamonds sparkle bright, and what more can I say, pandora out does itself every season! Rated 5 out of 5 by TracyFayeRN from Unique design I bought 2 of these. One of each for me and my mom. I personally love this one. It is simple but unique. I don't really like bangles but the idea of half bangle half chain is smart. It is lightweight too.